Time, it's been said, is fleeting. But the desire for cookies is everlasting. Anyone with a cookie monster in the house knows this. They also know the desire for homemade cookies doesn't always coincide with the time and energy to church out some goodness. Therefore, the folks at the Culinary Institute of America have their own version of pre-made cookies. Except instead of paying four times the cost of ingredients to buy them at the store, you assemble the dough and slice the cookies, then freeze them. That lets you take out however many cookies you want at any time, any day. They're the original "slice and bake" cookies. Do you think Grandma sat around all day mixing and measuring, waiting for your arrival? She threw together batches of her favorite cookies ahead of time, froze the dough, then sliced and baked them straight from the freezer, perfectly timed for your arrival. Making refrigerator cookies is simple, quick and gives you the flexibility to cook as many, or as few cookies as you need, when you need them. The basic method starts with creaming softened, room temperature butter with the sugar until light. This process cuts sugar crystals into the fat, creating tiny air pockets which expand during baking. Leavening further inflates these tiny air pockets, giving baked goods their lift." 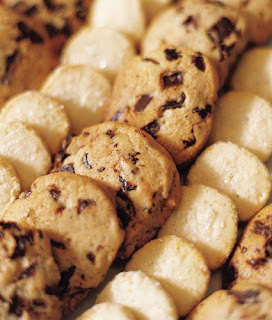 The secret to making great tender cookies is not to over mix," says Alison McLoughlin, chef instructor at CIA. "As soon as you see the dough come together you are done." 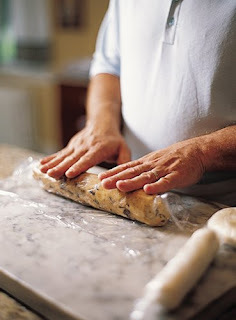 After mixing, shape the dough into a log on a large sheet of plastic wrap or parchment paper. Roll the wrap around the dough, forming a long log. Wrap completely then freeze for one hour, then slice and bake. For longer freezer storage, wrap a piece of heavy duty foil around the wrapped log and freeze for up to two months. 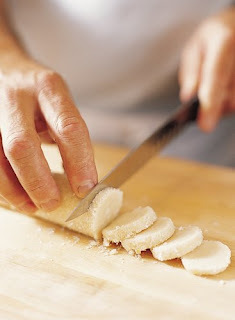 Slice them while still frozen for even, thin slices and turn the log every few slices to avoid flattening the dough. Bake them according to recipe directions, adding a minute or so if still fully frozen. In the bowl of an electric mixer, cream the butter and sugars on medium speed with the paddle attachment, scraping down the bowl periodically, until the mixture is smooth and light in color, about five minutes. Combine the eggs and vanilla. Add to the butter-sugar mixture and blend until fully incorporated, scraping down the bowl as needed. On low speed, mix in the sifted dry ingredients and the chocolate chunks until just incorporated. Arrange the cookies on the parchment-lined baking sheets in even rows. Bake at 375 until golden brown around the edges, about 12 to 14 minutes. Cool completely on cookie sheets. Using an electric mixer with the paddle attachment, cream together the sugar, butter, vanilla extract, and lemon zest on medium speed until smooth and light, about three to five minutes. Add the flour all at once and mix on low speed until combined. 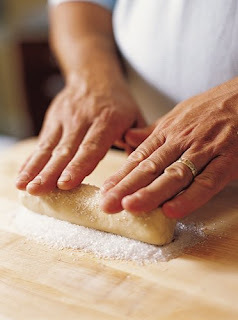 Divide the dough in half and roll into six-inch long cylinders, about one and one-quarter-inch in diameter. At this point, the cookies may be tightly wrapped in plastic wrap and frozen or refrigerated for later use, or they may be prepared for baking. To bake the cookies, preheat the oven to 350. Brush the cylinders of cookie dough with milk and roll them in coarse sugar. Cut the logs into one-quarter-inch thick slices, sprinkle the tops with additional coarse sugar, and place them on parchment-lined baking sheets. Bake for 12 minutes or until light golden brown.